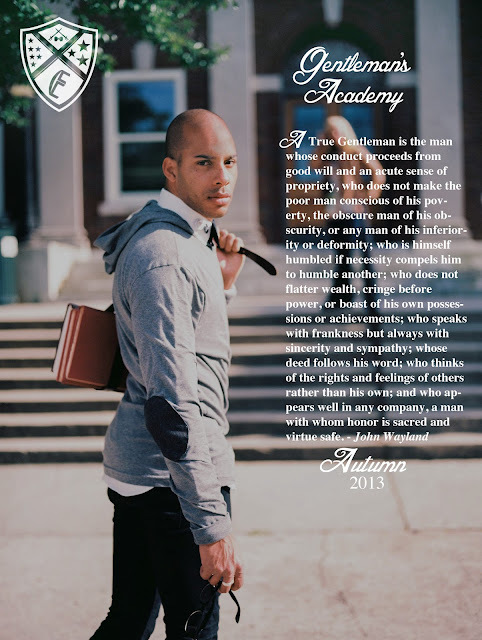 I am here with an exclusive sneak peek of the cover image for the "Gentlemans Academy", which is the 2013 Autumn collection from Equalnox Clothing. The quality of the photo impressed me so much I had to share my overall thoughts of the cover. With such a clean crisp photo featuring a handsome young model, of course the viewer's eye is automatically intrigued. However a cute face is not complete with out a stellar wardrobe. I think the Equalnox team did a great job with the pieces chosen. I am a big fan of elbow patches so to see this combined with a hooded shirt was a WIN! It is clear that Equalnox is moving in the direction of higher end items. The model is giving us edgy prep and it is definitely a good look for the "Gentleman's academy". What I also loved was the minor details included such as the book satchel over the shoulder and the "academy" in the background, which all help turn the over all look into something major. Equalnox also added a great quote from John Walter Wayland, a professor and author, on what a True Gentleman is. This was very fitting for the collection since it is the "Gentleman's Academy". Overall, the Equalnox team did a great job with this cover and I can honestly say I could see this on page of my favorite fashion magazines. I look forward to seeing what the Gentleman's Academy collection consist of in the near future. What are your thoughts on this cover image? I would love to hear from you below. If you haven't already check out my exclusive interview with Founder of Equalnox Clothing, Jordan Bell here.